I’m SUPER excited to be launching a new blog series called The Bag Buzz where I share photos of the bag I’m currently using (and obviously loving! ), what I’m keeping in it, and how I organize its contents. I decided to file this under TheBusyBeeBuzz category as opposed to OrganizedLikeJen, because I’m thinking of it as just a fun peek at what’s in my bag on a more frequent basis than the annual or so What’s In My Bag video I tend to film. Let me know how you like this idea and if the general consensus is a thumb’s up I will post a new one of these when I switch up my bag again. I purchased the Santa Rosalia Scout a few months ago during Kate Spade’s Friends & Family sale. I had been eying the bag for awhile and spent the duration of the sale considering the purchase before I finally decided that I must have the bag on the very last day that the 20% off discount was being offered. I tend to hem and haw over big purchases like this one, but it was definitely love at first sight. I couldn’t imagine liking the real deal any more than I anticipated from the online photos, but I really do! It’s the perfect summer cross-body style shoulder bag. I’ve been wearing it pretty much exclusively for well over a month now. I haven’t gotten the itch to switch to another bag in my collection yet, which I usually do after a month or so. The bag itself is big enough to hold all of my essentials, but small enough that I don’t overdo it. When I wear bigger bags, I carry more stuff. After sustaining a lower back injury late this spring, I knew I needed to carry a lighter purse for awhile. I had originally purchased the Scout as a “once in awhile” type of bag for date nights and vacations. I’ve been wanting a brown cross-body style bag for this purpose for a long time now. I’m so happy I decided to go for it. 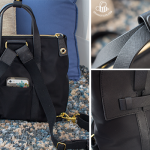 Not only is it the perfect addition to my bag collection, it’s also been a great everyday purse option for me this summer so as to not carry too much. It came in super handy when my back was still healing, and although it is mercifully all better now, I am still loving my Scout. The bag is made with a lovely floral embossed leather with matching trim on the exterior, caroleena spade dot lining on the inside, and finished with 14-karat light gold plated hardware. There are several organizational components built in. It has one main section, one smaller pouch style space, an interior zip pocket, and two small interior slip pockets. The flap secures with a magnetic closure. The front pouch pocket is the perfect size to store my phone, vlogging camera, and lip products for easy access. 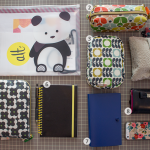 I use vertical organization throughout the bag to use the available space as effeciently as possible. 1. The blue Prada wallet I got for my birthday last year. 2. My iPhone with a cute Lilly Pulitzer case. 3. Car Keys with a Swiss Army knife I actually bought in Switzerland eleven (eek!) years ago and a Henri Bendel keychain (the clip comes in very handy in other bags with key fobs). Also, my house keys on a special keychain that was a gift. 4. My shoulder bag size Walking Pharmacy in a Prada pouch. 5. Vlogging camera for on the go filming. 6. Lip products galore! The Maybelline Baby Lips lives in this bag full time and I add in whatever other lip stuff I’m wearing that day. 7. Poopy bags, essential for any dog owner. 8. A small Hello Kitty tin filled with dog treats for Winnie. 9. FCS Hand Sanitzer (my favorite kind!). 10. A small Coach card case that I keep nonessential store cards, rewards cards, and gift cards in. 11. A clear plastic zip top envelope (fromThe Container Store) where I stash my coupons. 12. My current obsession – Trader Joe’s Organic Ginger Mints. I hope you enjoyed a peek into my bag. 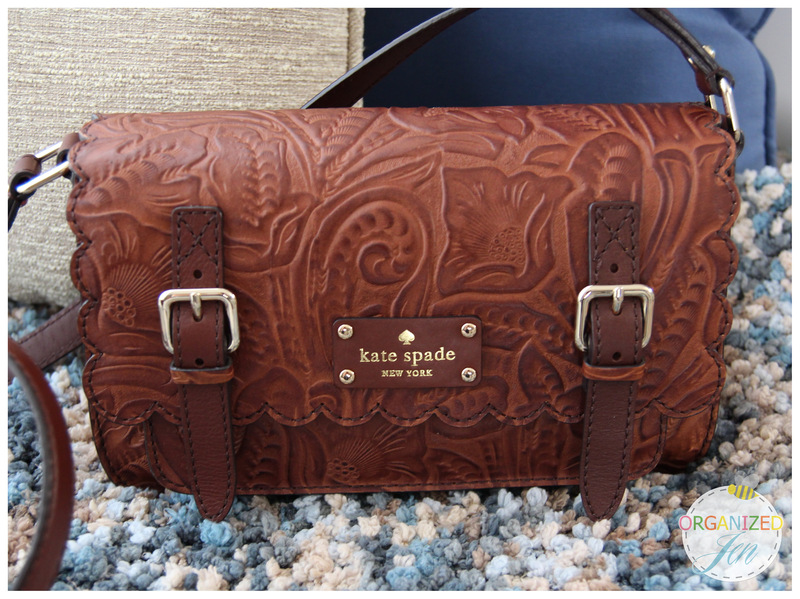 I enjoyed sharing with you from one purse lover to another! Let me know if you’re interested in seeing future updates whenever I change my bag. Super cute purse! I always find it hard to switch from a small purse to a bigger purse (hard to fill it up and then when you do it gets heavier) or from a big purse to a smaller purse (can’t fit as much stuff and you start missing what you couldn’t put in)!! Two thumbs up for you doing this kind of blog post again!! How fun! I’d love to see more posts like this! I just wanted to tell you that I got the idea of changing my bag each month from your misc. monthlies. Now all of my bags are getting equal love. It has also helped me to eliminate bags I don’t really use and to keep from buying new ones. I hope to have no more that 12 bags at any one time. Maybe less if I repeat. Thanks for the great idea. Great post, Jen! Loved the format. Oh my STARS I adore this bag! I wish I wasn’t such a poor college student so I could get it – it’s just stunning! Love the Bag Buzz and would definitely love to see future updates! Thumbs Up! Keep doing more of these! Also, if something changes in your walking pharmacy! I always love what’s in my bag videos. I say yes to doing a blog post whenever you switch. Can I ask for one additional pic for the future can you have a pic of you holding the bag. Either in a mirror or have don take it whatever. I just like being able to see the size in perspective with the person. And since you’ve already posted this one maybe add an Instagram pic? OMG!!! Jen you are killing me!! What a beautiful purse, I love it. I ABSOLUTELY love your purse collection. I am saving up for my first LV wallet and purse and let me tell you I can’t wait. Then I will be purchasing a Kate Spade, and then Gucci, and so forth. I want to get a few high end purses, then last longer and they are a great investment. I’m sticking that!! Thank you for sharing. Sounds like a great series…. right up your alley, too. 🙂 You and Don are such a neat couple. Thanks for sharing these tidbits of your life. I watch most of your videos and find them helpful, entertaining and refreshing! Love the Bag BUZZ. WHAT FUN!!!!! Thanks for all of your continued awesomeness Jen! Sounds really good. I really love your series. I am organized but still I learn things from you every time. Love the bag updates – keep them coming. Great bag! I enjoyed the post. I do miss you showing the bags on YT. It is a much easier format for me to follow. I can watch “what’s in my bag” and multitask. I enjoy your sharing with all of us! I don’t post them often, because I tend to carry the same kinds of contents in my bags from year to year even though I switch out my bags quite a bit. I thought the blog post series would be a nice way to share without being too redundant in my videos. YES please more posts like this so loving your blog. Hello Jen! I’m a new fan of your blog and videos. I am loving all your content so far. You’ve inspired me to start organizing again. It’s something I love but that gets ignored when I get busy and/or stressed (which in turn makes me more stressed about my messy space). I vote yes–keep posting when you swap bags! I vote yes! This will be a great addition to the Busy Bee Buzz! Do you vary the size of your walking pharmacy to fit the shape of your bag? And in order to do that, do you have to omit what is inside or do you find smaller versions of the items you would normally carry? Makes perfect sense 🙂 I subscribed to all your channels last December, I believe, so I missed that series of videos. Will go back and check those out. Thanks for responding! LOVE THIS! Keep these posts coming, Jen! Love the bag!! And love these kinds of posts! I just might have to get this bag!! I’ve switched to all cross body bags because of a bad shoulder. I have nothing brown. Absolutely love this! Could you show what’s in your walking pharmacy? Hi Jen please keep the Bag Buzzcoming I love this post,too.Can u do an update kitchen tour video,please? Hello Jen! do you still planning to organize auctions with bags? to me it would be very interesting 🙂 as for these posts I just love this kind of description of bags and their contents, please keep doing it. Wow! What a gorgeous bag! Thanks for sharing. 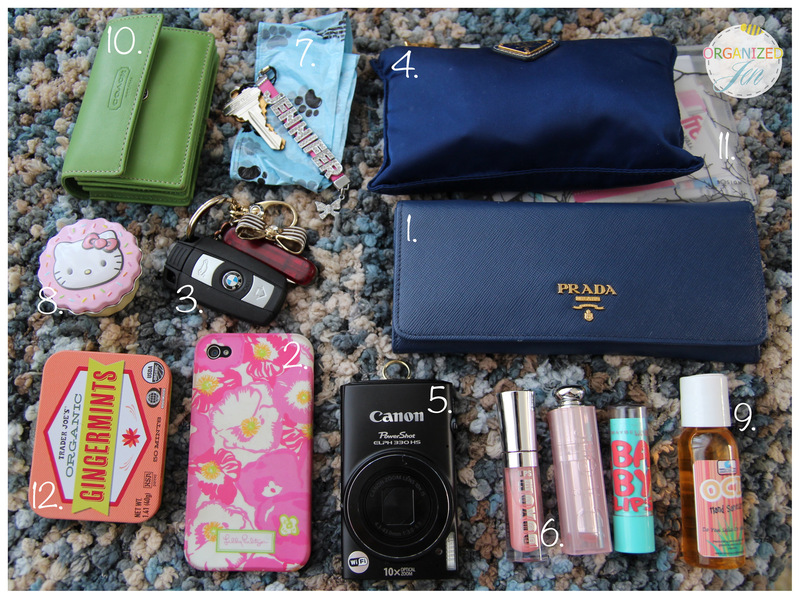 What’s in my bag posts/videos are always some of my favorites! I actually did buy that at a Coach outlet…about 8 years ago. Hopefully they still carry something similar! I would absolutely LOVE to see this happening! I love bags and can’t get enough of them, so this is a great idea! Jen, do you have a video or blog post about what you have in your ‘walking pharmacy’? Love this post and the bag as well! Its a beauty! I’ve been asked that quite a bit recently. I’m considering filming an updated collection video later this year. 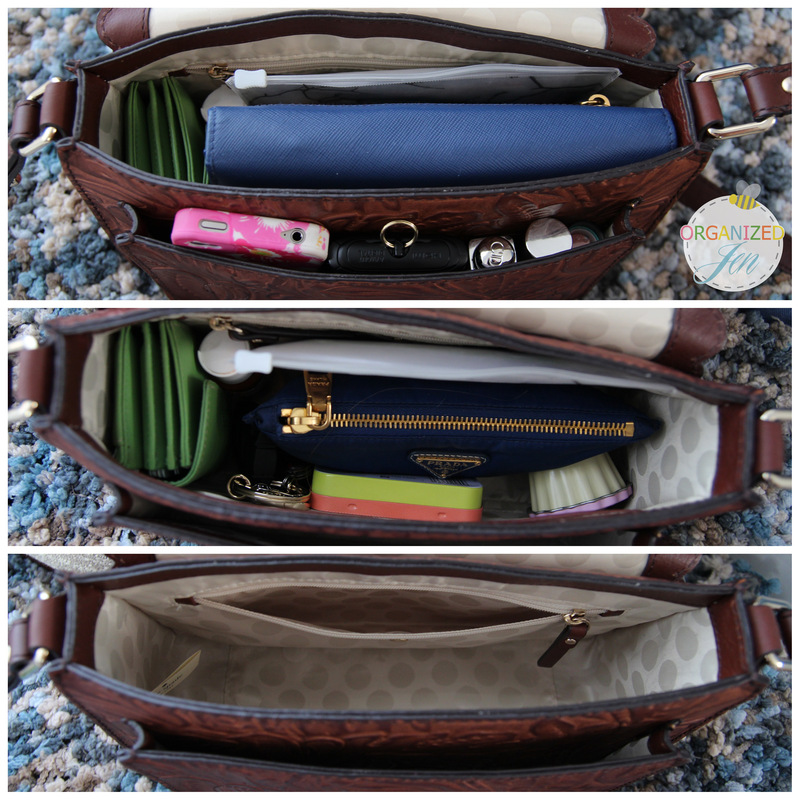 About that updated purse & wallet video video, will you be filming it for MHWL OR TBBB? P.S. : Thanks for responding to my question!! Loved this new idea! Please keep sharing….and Darling bag!! Hi! I’ve been looking for this bag for my honeymoon to Italy this summer – do you still have yours? would you be willing to part with it? I do still have it and don’t plan on parting with it at the moment. I’m sure the perfect bag is out there for you!